Do you see many children playing outside when you drive home from work? Although kids once spent long periods of time outdoors in previous generations, today's youth are less likely to enjoy spontaneous games of hide and seek or kickball. In fact, parents of eight to 12 year olds reported that their kids spend three times as much time using computers and watching TV as they do playing outside, according to The Nature of Americans National Report. Unfortunately, lack of outdoor time can make it hard to see clearly. What Happens When Kids Spend Less Time Outdoors? Lack of exposure to sunlight has been linked to an increased incidence of myopia in children. Myopia, commonly called nearsightedness, makes it difficult to see distant objects clearly without prescription eyeglasses or contact lenses. The refractive error occurs when the eye becomes too long from the front to the back. As a result, light rays don't focus directly on the retina, but in front of it. Although wearing glasses has always been a part of childhood for some children, myopia rates have been increasing lately. Genetics certainly plays a role in myopia. Children of myopic parents are more likely to develop myopia themselves, but inheritance isn't necessarily the sole cause of nearsightedness. Close work, like reading or working on computers for hours at a time, may increase the chance that a child will develop the refractive error. In most cases, myopia is merely an inconvenience, but it can cause other eye problems in adulthood if it's severe. Retinal tears, cataracts, retinal and vitreous detachments, glaucoma and macular degeneration may be more likely to occur if you need corrective lenses greater than 5 diopters. In the past, myopia rates remained fairly steady, but that's changed in the last several decades. Myopia cases increased by 66 percent from 1971-72 and 1999-2004, according to a National Eye Institute Research Study. Researchers believe that the increase is due to fewer hours spent outdoors and increased reliance on digital devices, like smartphones, laptops and tablets. 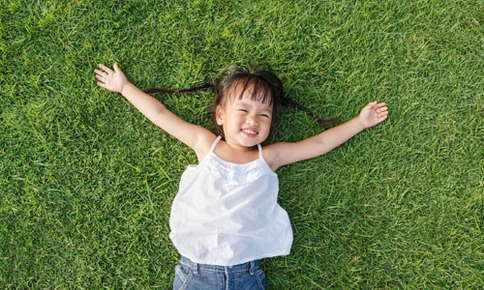 Increasing outdoor exposure can have a very beneficial effect on kids' eyes. Chinese children who spent an additional 40 minutes outdoors every day experienced a lower level of myopia when compared to their classmates who remained indoors. Another study determined that children who have myopic parents but spend 14 hours outside weekly have the same risk of developing nearsightedness as peers whose parents aren't myopic. Encouraging More Outdoor Time. Spending an hour or two outdoors every day is a simple way to protect your child's vision. Limiting Digital Devices. Reducing the time your child spends playing games or surfing the Internet not only offers protection against myopia, but also prevents painful back and neck pain that can occur when your son or daughter bends his or her neck to view digital devices. Requiring Frequent Breaks. Whether your child is an avid reader or gamer, ask him or her to take breaks every half hour for at least 20 minutes. Breaks are the perfect time to spend a little time outdoors. Provide Foods That Nourish the Eyes. Foods that offer vitamins A, C, E or other nutrients necessary for good vision can help your child reduce his or her risk of developing several eye disease and conditions, including cataracts, glaucoma and age-related macular degeneration. Vision-friendly foods include carrots, peppers, whole grains, dairy products, salmon, citrus fruits, blueberries, spinach and other dark, leafy vegetables. Increased outdoor time, reduced reliance on digital devices and regular visits to the optometrist can help you protect your child's vision. If it's time for a vision exam, or your son or daughter has been complaining of blurred vision, headaches or eyestrain, call us to schedule an appointment. "At our office we offer comprehensvie eye exams. Dr. Kosier does eye evaluations for Diabetes, Glaucoma, Cataracts, Macular Degeneration, Dry Eye, Eye Lids, and much more. Please call our office to schedule an exam. We look forward to meeting you."